Perfect for your dorm dresser or dorm desk drawers! Dorm Co. Tip: Keep small dorm items organized where you won't lose anything! Dimensions: 11.9" x 11.9" x 1.7"
When you're unpacking all of your small dorm items, you may end up putting them in their overall home but after a day or two you could end up finding that all of the small dorm items blend together messily. This can be quite frustrating because you think you have everything neatly organized and then after a few times opening and closing your dorm dresser or desk drawers, everything has gone wherever it wants to. The problem is as soon as you have figured out where the extra pack of staples is in your dorm desk, the next time you open your desk it will be in a different spot or worse- it's completely gone. You don't want to have to rummage through your dorm drawers to find a simple highlighter or certain cosmetic brush and end up not finding it until dorm move-out day. Keep your small dorm items organized and in arm's reach with simple dorm organizers like our 6 Section Dorm Drawer Organizer! Our 6 Section Dorm Drawer Organizer has six sections in three different sizes to best organize your dorm items. Running along the center of the organizer is a large compartment that can easily fit your writing utensils and there are three small and two medium sections on each side that are perfect for holding paperclips, sticky notes and other dorm desk essentials. 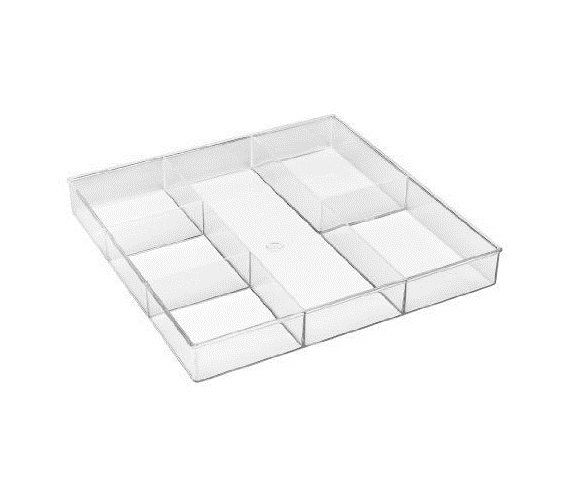 What is great about this 6 Section Dorm Drawer Organizer is it is also perfectly sized for cosmetic brushes, eyeshadows and other dorm items. Don't stress over having to look for a dorm essential and find that it keeps moving around- add our simple dorm organizer to your dorm dresser and desk drawers!